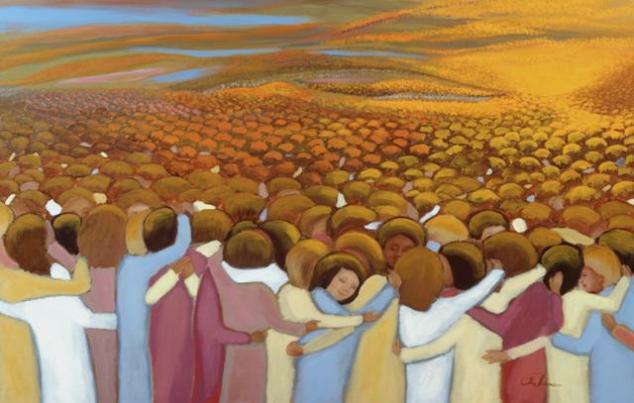 Waves of individual persons are united in an embrace for all eternity in Heaven. Oblivious to our eternal destiny, we go around planning our lives, building careers, and investing our concerns in wealth, health and the immediate future. Let us also give some thought to the future that has no end. Let us “look to the resurrection of the dead, and the life of the world to come,” as we profess to in the Creed. Stretching the imagination I ask, “What kind of creature will I be on beholding the Beatific Vision?” Surely, I will be absorbed in contemplating God, but would I no longer be aware of myself, or of other saints? I cannot fathom the would-be powers of not being confined to space and time. It would be a space-less, everlasting-now; one present moment when the saints connect as one. And as Christ’s bride, the communion of saints is one with Him, making our love for God the perfect love of Christ for the Father. I imagine we will be swooped up in the life of the Trinity, as individuals and as community. Although greatly inferior to the love of God, our love for each saint would be so strong and uniting as to become that saint; to live through each other’s lives, past and future melted in the everlasting-now. May we put our priorities in order while we are still in the womb of the world, and alone, looking earnestly to our birth into that eternal cosmos where the saints adore God!